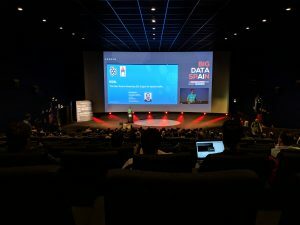 In November 2018, I was back in Madrid to speak at Big Data Spain. A great event all about big data, analytics and machine learning. One of the largest tech companies in Spain. A perfect event to talk about KSQL – The Streaming SQL Engine for Apache Kafka. Big Data Spain is held in Kinepolis, a big cinema. One of my favorite locations for a tech conference – for speakers and audience. All talks at Big Data Spain are recorded. Video recording and slides below. The rapidly expanding world of stream processing can be daunting, with new concepts such as various types of time semantics, windowed aggregates, changelogs, and programming frameworks to master. KSQL is an open-source, Apache 2.0 licensed streaming SQL engine on top of Apache Kafka which aims to simplify all this and make stream processing available to everyone. Even though it is simple to use, KSQL is built for mission-critical and scalable production deployments (using Kafka Streams under the hood). Benefits of using KSQL include: No coding required; no additional analytics cluster needed; streams and tables as first-class constructs; access to the rich Kafka ecosystem. This session introduces the concepts and architecture of KSQL. Use cases such as Streaming ETL, Real Time Stream Monitoring or Anomaly Detection are discussed. A live demo shows how to setup and use KSQL quickly and easily on top of your Kafka ecosystem. This entry was posted	on Thursday, November 15th, 2018 at 07:35	and is filed under Apache Kafka, Big Data, Kafka Streams, KSQL, Open Source. You can follow any responses to this entry through the RSS 2.0 feed. You can leave a response, or trackback from your own site. Do you want to subscribe via email to receive new comments? Powered by WordPress v 5.1.1. Page in 0.212 seconds.